Here is a link to all of the available current videos from the verse by verse study in The Book of Revelation that I have posted. There are eight videos at this time. I will continue to add to them. Click the Bible below. you will have to let the videos load a bit first ... They can be SLOW! To view the videos below, you need to have RealPlayer on your computer. Real Player also allows you to download the videos on your computer! 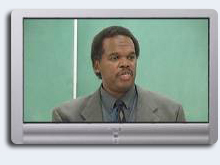 The videos below are the actual, full-length TV Program from our "What Saith The Scripture" Cable television program. For more information about the program times and stations please go to our Cable TV page. How the church is duped! Click the TV to view the movie.